When traffic signal controllers are under actuated-coordinated operation, it may be necessary to determine the permissive periods and force-offs for each phase. These values may be needed for entering signal timing plans in traffic controllers as well as traffic simulation models. A permissive period represent a window of opportunity during the cycle in which a vehicle must activate the detector to receive the green indication. If a vehicle arrives after this period, it will have to wait until the next cycle to be served. Although these calculations are not difficult in principle, a lot of confusion can arise due with the differences in controller types, phasing plans, and a lack of documentation explaining these calculations. 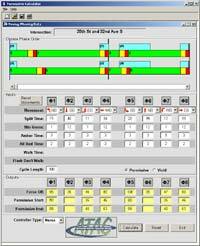 Permissive Period Calculator (PPC) is a utility developed by ATAC that is designed to perform these calculations and provide a graphical representation of the permissive windows. PPC allows the user to specify either NEMA or Type 170 controllers, left turn lead or lag operation, and Permissive or Yield modes of coordination. Although the program cannot be used for all scenarios, it is a beneficial tool for a large majority of signal timing designs. Note: PPC 2.0 corrects issues related to saving and significant digits.